Well hello, new friend! 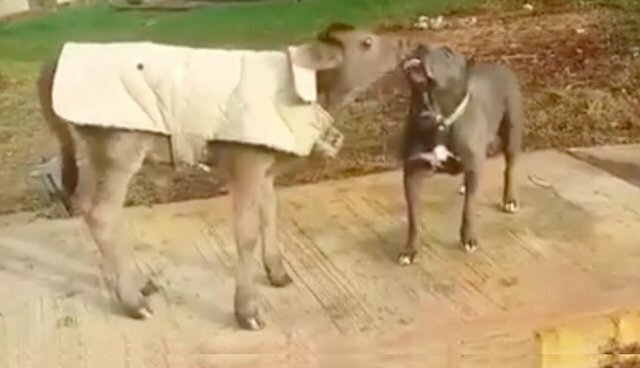 In this sweet video, a day-old baby cow named Bernie greets Betty, a beautiful pit bull. They exchange a lick and a snuggle. Turns out that the baby cow, recently rescued from an auction, had milk on his face after a bottle-feeding session. Like most babies, he's a messy eater, so Betty gave him a sisterly snuggle and clean up - while getting a snack in the process. When Bernie is older he'll live out his days with another cow, Bubbles, on a 16-acre ranch in California. But for now he's best friends with Betty, who is also a rescue. Her old life was full of abuse - she was forcibly bred, starved, neglected, and chained in a backyard for the first six years of her life. Then she was rescued just over a year ago by the owner of HiCaliber Horse Rescue, a home for abused horses and other animals. HiCaliber sometimes partners with Stand Up for Pits, the organization that led The Dodo to Betty and Bernie. 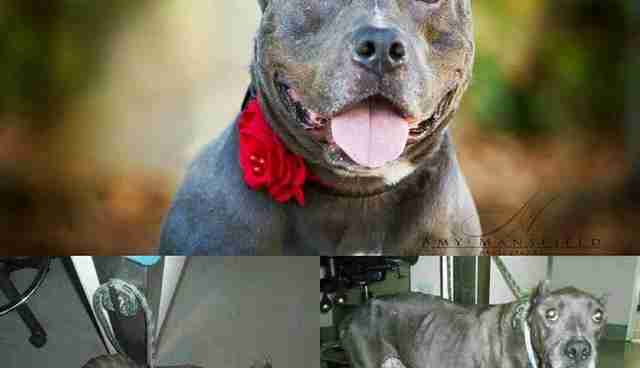 Now, Betty is thriving and grateful to be in a happy place. She's kind to tiny kids and serves as a pit bull "ambassador," dispelling myths to hundreds of visitors about her breed. She even has a shared Facebook page, Follow Bruce and Betty. Her buddy Bruce has been getting most of the attention lately because he's had a rough medical journey. But there's Betty, smiling.